The situation in the Gulf, in regard to the Deepwater Horizon fire and oil spill continues to evolve. Since my last post on this, the size of the operation has continued to grow, with some thought now being given to dredging barriers along the coastline. What I thought I cover a little today, among other things, is the problems that occur when oil leaves a hot reservoir and suddenly enters a pipe on the floor of a very cold sea, causing some of the constituent chemicals to crystallize out. To illustrate this, I took a picture of one of the pipes that used to sit in my office, since it helped visualize a problem we had been given, and is along the lines of that now facing BP. Barium Sulfate Crystals growing in a 3-inch I.D. pipe that carried oil from the deposits under the North Sea. (Scale is in cm) (Growths of this size can occur in less than 24 hours). 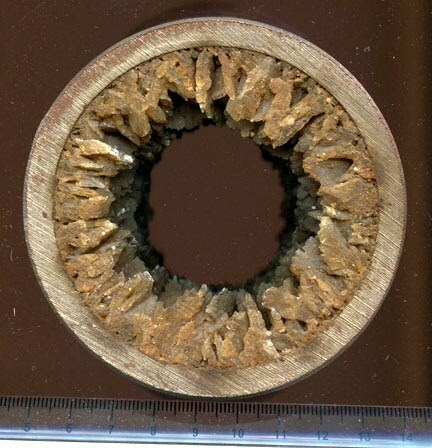 You will note that the crystals have reduced the effective diameter of the pipe down to about 1.5 inches, cutting the flow the pipe can carry by 75% (roughly). These are but one example of a number of different chemicals that can precipitate out in the pipes that carry oil from the reservoir, where it hot, up through colder zones as it rises through the different pipes on its way to land. There are two different aspects to the problem that I want to cover since it relates to the formation of methane hydrates in the capture box that BP had fielded at the end of last week. The first of these is on the growth of the crystal hydrates within the confinement box that BP had lowered over the middle leak in the riser. However, rather than dig back into my notes, I am going to suggest that those who want to understand the chemistry/physics go to The Obligate Scientist. 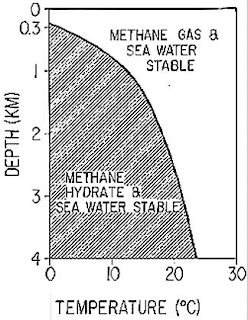 He uses a plot from the USGS to illustrate the conditions that transition methane gas to methane hydrate as a function of temperature and pressure (depth in the ocean). 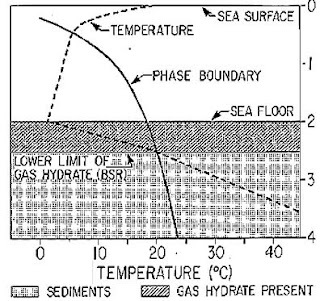 To which, to give it current relevance, the USGS have added what happens at the sea bed, exemplifying this with a seabed at 2 km deep, while in this case it is only about 1.6 km. However the temperature is still sufficiently low to cause the hydrates to form. The temperature of the fluid is critical, as can be seen, but for the temperature to reach that level requires a certain amount of residence time, for heat transfer to take place. Unfortunately in constructing the box the way that BP did, while providing stabilizing plates that would stop the box sinking into the sediment, these also act as heat radiators, ensuring a very rapid heat loss to the surrounding sea and a faster drop in temperature for the gas, accelerating the formation of the hydrates. As I mentioned above there are two problems that then arise. The first of these is the immediate constriction of the flow path, as the first figure shows, the second is that if the crystals were to break off, or grow freely to that size and then enter the flow channel, then unless they are all smaller than about 30-40% of the flow channel diameter, then they will jam together and block the flow channel. (I have photographs somewhere of a pair of particles, both nominally less than half a tube diameter wedged together in the middle of said tube and effectively blocking it – hence the rule of thumb). So as the crystals grow they both reduce the flow channel itself, and also increase the risk of total blockage. Now it might be suggested that if the speed of the fluid were increased that this would not give the crystals time enough to form and cause the above problems. These are three, originally similar sized nozzles through which water was fed at 40,000 psi. (It is used in industrial cutting) The top orifice was totally blocked after 48 hours of operation using untreated tap water, the center orifice is largely closed after 104 hours using softened water, and the bottom orifice is still clear after 200 hours using de-ionized water. 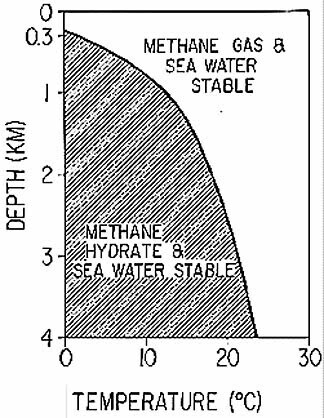 The water velocity was around 2,400 ft/sec and, as you may note deposits still grew. Keeping deposits from clogging feed lines is thus a tad more complicated than it may first appear. And while I note that BP is now apparently planning on lowering a second smaller cap into position, there may need to be other modifications (such as an inner liner of Teflon to insulate the flow from the radiative metal of the box) that have been added (perhaps an internal heating system) to help alleviate the problem. There was a “real time” transcript of the press conference that BP held at noon (6 pm in the UK) in which they commented that the second dome that they will try to cap the well with is going to be much smaller (about the size of a barrel) and that this should be tried within three days , and if that doesn’t work they are thinking of tapping into the pipe to drain the oil without seawater contamination. One of the problems, apparently has been the high gas content of the oil. Much higher than had been anticipated. The box is being made smaller so that warm water (from the surface) can be poured over it to keep the temperature above that at which the hydrates form. Now they've gone from "one extreme to the other". The "top hat" dome is 5ft tall, 4ft wide. Warm sea water will be pumped down. As they lower the dome it will already be operational - hooked up to a ship on the surface. It will be more difficult to place but they will succeed. It should be in place by the end of the week. Thank you for sharing your valuable insight on this terrible event. Question - If the confinement box can be cooled to the point where crystals form, blocking/ limiting flow, can the leaking pipes themselves be cooled for the same effect? They are cooled, but the pressure in the pipe is much higher before the oil gets to the leak and so the gas won't be able to form hydrates until it comes out of the pipe and sees only the water pressure. The inter-relations between pressure, temperature, gas concentration in the oil and heat transfer rates are not, unfortunately, simple. Thanks. I may have missed the transcript that stated the pressure in the leaking pipes. I know I read that BP planned to measure it, but haven't seen mention of pressure since. I don't think they have a value at the moment, but if they are going to do a hot tap of the pipe they should probably have one before they do too much, but with all the disruption not sure that they have much left in the way of viable instrumentation on the BOP, though there was some talk of their replacing a lot of stuff that they could get off. When the riser went it took all the instrumentation with it. They may have been able to tap into some of the gages with the ROVs, though my recollection is that they still have all the BOP control box on the surface trying to wire it to take command of the BOP. How much risk and effort would go into taking these measurement at the leak in the gulf? Is pressure measured at the injector head, well head, or both sides of the BPO? It seems to me that pressure, temperature, etc. would be very useful data for methodically resolving this problem. Wouldn't pressure be critical for accurately determining the extent of the leak? And a hypothesis was floated that the BPO may have partially engaged the pipe - wouldn't a pressure measure provide clarity here? I don't mean to seem a conspiracist, but this information would seem quite sensitive in terms of liability for the various parties involved. Is it possible that some measurement are being ignored or simply not published? I suspect that those who have whatever data is available are just too busy trying to find answers to talk to the press. Having been in situations where we were trying to solve geotechnical problems in real time, the focus is on finding answers that work and all the information is pored over in detail, without much thought as to who, outside of those working the problem, would like to see it.